The maximum continuous current rating for a cable is limited by conductor size, number of conductors contained within the cable, maximum temperature rating of the cable, and environmental conditions such as ambient temperature and air flow. To use the current capacity chart, first determine conductor size, temperature rating, and number of conductors from the applicable product description for the cable of interest. Next, find the current value on the chart for the proper temperature rating and conductor size. 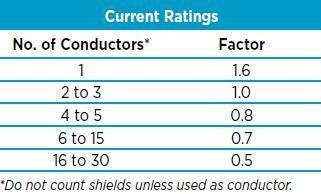 To calculate the maximum current rating/conductor, multiply the chart value by the appropriate conductor factor. The chart assumes cable is surrounded by still air at an ambient temperature of 25°C. Current values are in RMS amperes and are valid for copper conductors only. For conditions other than specified, contact Alpha Technical Support at 1-800-52-ALPHA. Note: Current ratings are intended as general guidelines for low power electronic communications and control applications. Current ratings for power applications generally are set by regulatory agencies such as UL, CSA, NEC, and others. For other tips and tricks, visit our master catalog technical information pages!